Fellow Camel rider, Jonathan Janstey created a nice example application for Apache Camel to demonstrate the simplicity and power of pure POJO routing using a few easy to understand annotations. Check out his blog how easy it is and the full example for more. Freemarker is a nice templating engine. They switched license from GPL to BSD and that is great news for the community as its Apache friendly. As of today a FUSE customer was using Velocity but had trouble with its internal usage of commons-collection, so as an engineer in the FUSESource team, we offered to integrate Freemarker with Camel as an alternative solution, so the customer can switch template engine and avoid the commons-collection jars. That is a double win for the Apache Camel community with the license change and the quick respond of the FUSESource team to help the customer. Now the component is committed into the public Apache SVN for the goods of the entire community. The camel-freemarker component will be part of Apache Camel 1.6 and also included in the FUSE enterprise Camel version v1.5.4.0. 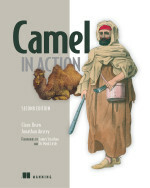 Apache Camel is now a top level project at Apache - you can find it at http://camel.apache.org/. Yay! Many thanks to all the Camel Riders who made this happen! For the people that has been following the Apache Camel community for some time, will know that I have been active in this community and was voted in as a committer for 6-7 months ago. I am happy to announce that I am new hire at Progress in the FUSE team since 1st January 2009, where I will work full time on Apache Camel. So if you thought before I might was working full time, I can tell, it was just in my spare time. So yeah there is room fore even more work and help on the user forums. As a new hire you are given a free choice of equipment at FUSESource so I took the opportunity to grab one of these fabulous MacBook Pro's. So this is my first blog entry I am wring from Mac. I must say I wish I have changed beforehand, but for 2.5 years ago when my last work computer was bought, the Mac wasn't as dominant computer for full time on-site client consultancy work. The transition to the Mac isn't without its fun. There are a lot of new key combinations to master, especially in IDEA that I have been using since v2.x. At one time I hit a combo that turned on a narrator, so my Mac would speak to me which keys I was typing or what I was seeing on the screen. Took me a while to find the settings to turn it off. This was just as fun, as its is to spin around in the Spaces. Can't live without it now. I wish to thank my former employer, Silverbullet, thank you very much for 2,5 years of good time with great colleagues and valuable experience doing full time client consultancy. I finally had some time and was in the mood to do some wiki bashing again. It's been long overdue since I last wrote a part of the lengthy Camel tutorial. Part 4 is four months old. - And the anticipated how to use CXF webservice endpoints directly in Camel routes. Oh and the link to part 5 is here.